Why our families keep coming back. See our results for yourself. We have a purpose built four chair facility that allows Dr Tait to see every patient on every visit. Issues: Significant deviation in dental midline associated with an anterior cross-bite and crowding. Treatment: Corrected midline, alignment and crowding. Removed one tooth. Upper and lower braces for 19 months followed by night time wear of upper and lower removable retainers was required. Issues: Dental crowding, especially in the lower, midline discrepancy and alignment issues. Treatment: Aligned the upper and lower teeth, corrected crowding, aligned midlines, and improved the bite. Fixed braces for 12 months. Issues: Adult male with large underbite, and crowding of bottom and front teeth. Treatment: 8 months of alignment with braces, followed by jaw surgery to move upper jaw forward and lower jaw back which provided a life changing improvement in facial appearance. Issues: “Buck teeth” from an increased horizontal and vertical overlap of top and bottom front teeth. Treatment: A two piece removable appliance for 12 months, followed by fixed braces for 8 months to fine tune alignment and bite. No teeth removed. Issues: Dental spacing, anterior open-bite, crowding, and narrow upper arch. Treatment: Mild dental expansion of upper arch, corrected anterior open-bite, aligned and improved fit of front and back teeth. Fixed braces used for 14 months. Issues: Large space between front teeth due to two missing teeth from patient being born without permanent lateral incisors. Front teeth have moved sideways to occupy space where missing teeth should be. Treatment: Fixed braces. Part plate with artificial lateral incisors. Future treatment will provide implants or adhesive bridges. Issues: Increased vertical overlap of top and bottom front teeth which gives an increased overbite, crowding and a bite problem. If left unchecked overbite could lead to longer term gum damage. 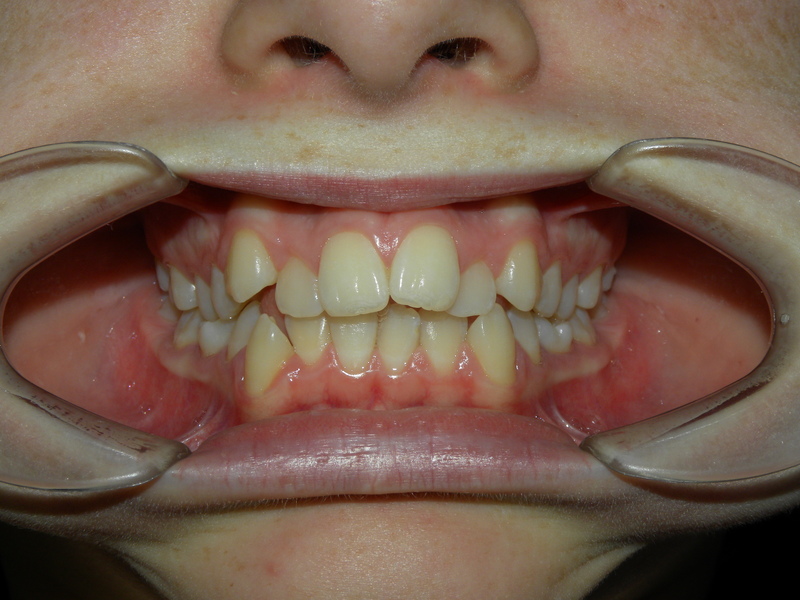 Treatment: Over 24 months combination of removable plate to correct vertical overlap, fixed braces and elastic bands. Treatment: 2 teeth removed in upper row, teeth aligned and spaces closed. Fixed braces 12 months.